Leashing yourself to your skis in the backcountry has benefits and drawbacks. If you are prone to yard sales and subsequent difficulty finding your skis, it can be a good idea to tie yourself in. If you are prone to getting caught in avalanches and swimming for your life, the last thing you need is to be anchored to anything that could pull you down. However if you end up resort skiing from time to time, the benefits are clearer: they are typically required by ski patrol who are keen to avoid untargeted missiles on their watch (targeted ones are usually banned at a higher jurisdiction). 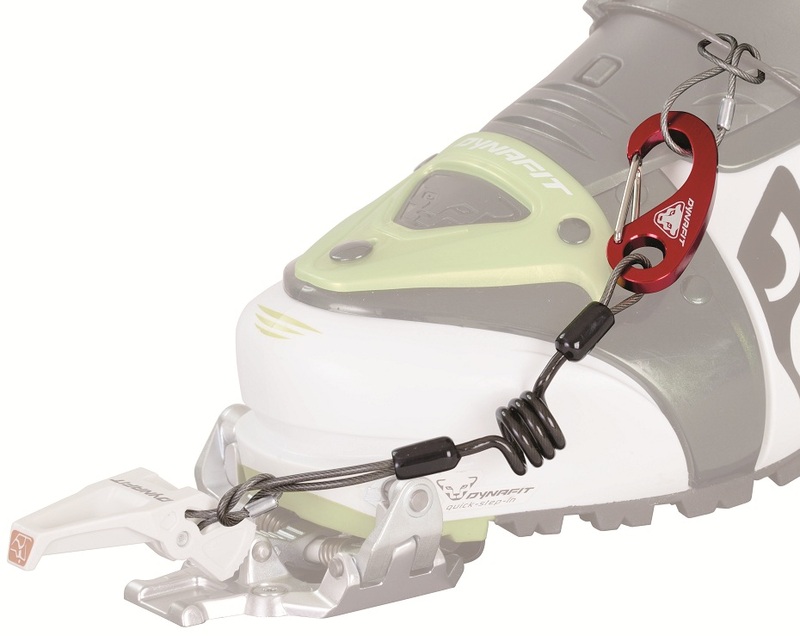 The Dynafit Guide Leash is especially designed for the Speed Radical and Speed Turn bindings, which both happen to come with a set. If you need a replacement or want to fit another binding with leashes, give these a look. They have a detachable clip built into the line that lets you clip in and out easily. Weight is 18 grams (0.4 ounces) each. Sold in pairs. 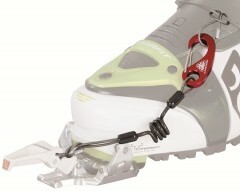 I purchased the Speed Radical bindings which came with these leashes, but after a couple tours replaced them with B&D leashes which I wrap around the cuff of the boot rather than attaching to the closure cable or an eyelet at the toe. The reason that I went for the replacement leashes was the very short length of the Dynafit leash. When you crash, or even when putting skis on in tricky backcountry situations I find the B&D (longer) leashes just work better for me and feel more safe (i.e. skis stay further away from you in a bad crash). If you like the shorter leash, these Dynafit leashes are excellent quality. The construction is first-rate. Finally, as others have pointed out, an avalanche-breakable link seems natural to be included in these leashes (like on the B&D), and their absence is notable. Hi Jesper, that wire loop doesn't come with the leashes but can be found in the Speed Rad replacement toe lever kit. could I use these on the Plum guides?? Hi svcci, yeah that is no problem. I've used these ever since I mounted my Speed Rads. They work fine and are not cumbersome or too long. I use medium strength zip-ties as the "connection" on my boots. The rational is that they would break away under heavy load (avalanche) but stay put under normal circumstances (typical wipeout on area). Until something better comes along or i prove myself wrong i'm sticking with this system. Maybe I'm wrong, but I thought the black bulbs that dynafit uses to fasten the wire loop back onto itself is engineered to give way under high stress (avalanche), but not break under normal crash conditions. This way you're not going through a bunch of zipties during the season (or even a single tour). That would be the first time I've heard that theory ... definitely possible but I'd guess the black bulb is just a plastic / rubber cover over the metal swag and unlikely to break except under extreme stress. I use multiple zip-ties in case a single one breaks. It's not perfect but until i hear otherwise i'm treating it as if it is not engineered to break. Dynafit doesn't list a breaking strength for the leashes. You can use the Maruelli safe loops for a pre-determined breaker. Can these work with the Speed Superlite binding? Looks like they could be attached but not sure. Hi Daniel. Yes you can use them on the Superlites. Just attach to one of the gaps in the frame. Are these sold as a pair or individually? Hey Layne, these are packaged as a pair but I can split one up if you need a single. Decent leashes, and one of the only commercially available in the states. If you really want your skis to stay on, these work great as stock, otherwise consider a release piece of twine of tab in between the small clip and the boot so your skis do leave when they're likely to do major damage.